It can be extremely challenging to establish a predictable income in the music industry. But it seems like many musicians are trying the same things hoping for different results, which is the definition of insanity. Ready to try something different? In this episode of The New Music Industry Podcast, I explain how to set up your own online fan club. 00:42 – Why set up a membership site? 01:27 – Who should set up a membership site? 02:47 – Who will join your membership site or fan club? 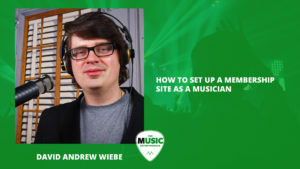 I found another thing not many people are talking about, but it’s something I’ll be looking at more so here on the podcast and on the blog, and that’s this idea of setting up a membership site as a musician. You might remember fan clubs. Fan clubs are still a thing. Some people join them, and like to be a part of them. This is a very similar idea, except we’re going to be utilizing some of the best technology that’s out there to make it happen and automate the process and make it simple for you. 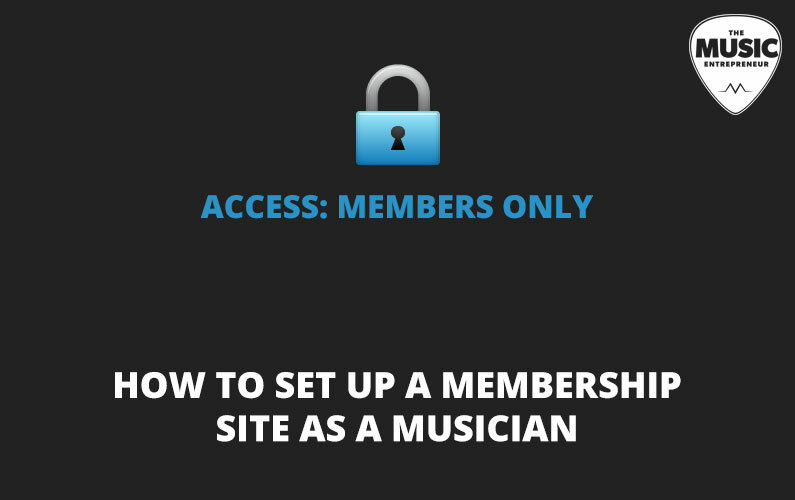 So, why would you want to bother setting up a membership site as a musician? This is something I’m working on for The Music Entrepreneur HQ as well, and there will be a membership option for those who want to be a part of it. The main reason to set up a site like this is to generate recurring revenue. The problem with music sales in general is that you get one here and three there, and it’s hard to get consistent sales and predictable income from that. Live performance is no different. It’s reliant on your ability to book good shows with good venues and keep them to their word and your agreement. With membership sites, as long as you maintain or grow your member base, you’ll have consistent income coming in month after month which is much more predictable than most other things you could be doing as a musician. So, who is this for? It’s obviously not for everybody. I’d say it’s for people with the time and resources to dedicate to it. So, if you can’t see yourself producing new content on a regular basis, if you don’t have a good backlog already, it’s going to be very hard to keep up with your members and to provide them with enough value to want to stay with you. So, you want to make sure you have the time and ability to consistently produce new content they enjoy. What should you offer your members? Here are a few ideas to get you started. You can give them discounted or free concert tickets, exclusive content like songs, audio blogs, or videos, behind-the-scenes footage, giveaways or contests, opportunities to collaborate with the band, vocal or instrumental lessons, or even remixes. The possibilities are endless. The point is to keep delivering the type of content your audience wants. You’ll figure that out over time. People will begin responding to the things they want, and they won’t talk about the things they don’t want. Or, they’ll give you negative feedback on the things they don’t want. Just adjust your strategy – it’s very simple. Keep in mind that you will have to promote your membership site to all your fans. If this is not something you’re comfortable doing, I’m not going to tell you not to push yourself, because I think it’s a good idea to keep growing yourself. But if you’re not willing to do it in the first place then there’s no point. You must promote what you’re doing. Keep in mind that your casual fans may not join, and that’s totally okay. That’s not the goal. You’re not trying to get your whole fan list on your membership site. You’re just trying to get the people who are loyal, and love you, and your diehard fans will join. So, it’s just giving them that opportunity. If they don’t know what’s available, they can’t join, so you must make them aware of what’s available. Now, I’m not going to sugarcoat it. Building a membership site will take work, and you must remind your audience why they should stay subscribed regularly. And if you have a video there waiting for them explaining what you’re going to do, what you’re going to offer, and why they joined in the first place, then there is a better chance they will stay with you over the long haul. There are many ways to set up a membership site. I like to keep things simple, and this is the solution I would be using right now. But my ideas on that might change on that later. It’s okay, we all need to tweak from time to time, right? There are many WordPress plugins out there you can use to set up a membership site, and that stuff’s all great. But here’s a simple way to get set up right now. I’ve talked about Gumroad before. I would suggest creating an account with them. Use Gumroad to sell subscriptions to your membership site. And then you can simply create a Facebook group for the people who purchased a membership and invite them to be a part of a community. Another great way to do is to invite them to your own Slack channel. It will serve the same function as your Facebook group. You can even upload all your downloads there. So, there’s a simple way to get started with membership sites. You can check out more sophisticated solutions, and you may end up needing them down the line. But I see no reason to complicate matters if you don’t have to. Just remember to set the price at a reasonable level, something your fans would be willing to play. You could just talk to your fans at your shows or wherever you go, and see what they’d be willing to do. Do you have any questions or comments? Leave them in the show notes. I look forward to hearing your thoughts on setting up a membership site.